The Trip Hostel opens its doors to travellers from all over the world. We are situated in the heart of Punta del Este, close to everything you need to have an amazing stay. 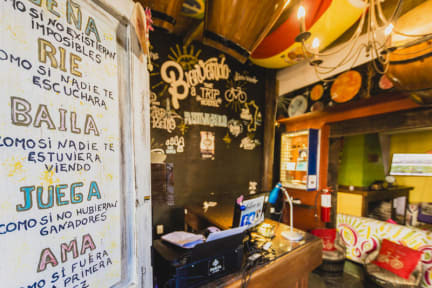 The hostel is conveniently located just two blocks from the bus station, two blocks from the main street, Gorlero, and two blocks from the most popular beaches in the area: Playa Mansa and Playa Brava. There is a 24-hr market located on the corner and a supermarket just 1 ½ blocks away. The Trip Hostel has the perfect combination of good vibes and comfort. It’s owned and operated by three young Punta del Este locals that go out of their way to make sure you enjoy your stay. There is a fully-equipped kitchen, BBQ areas, a rooftop terrace, and a common area with cable TV. into the hostel to enjoy in our bar. Our exclusive bar has nightly drink specials, summertime Happy Hour drinks, and the best atmosphere to party before enjoying a night out at the local clubs. We offer a unique handcrafted beer sold only in our bar. For your entertainment, we have instruments you can play, and if you are lucky you’ll catch a live reggae-ska concert! Hostel très accueillant, cosy. Jolies terrasses et bonne ambiance le soir. Seul petit bemol 3 étages de lits dans les chambres donc très peu d'espace. L'emplacement est super, a coté de la plage !